CM silently released their latest quad core smartphone to one of their authorized reseller that posted the details of Cherry Mobile Fuze specs and photos on their Facebook page. But before that, they already teased series of flyer, first is a phot with ‘I got the Power’ caption. Next to that is the photo with battery plus USB cable that is equals to an winking emoticon. The last is captioned with ‘GO 4000mAh Quad Core’. This could be the answer to all those who keeps on complaining about the battery power of their smartphone. If your Cherry Mobile Flare battery doesn’t last for a day on heavy usage then add this phone on your wishlist instead of buying a powebank why not upgrade it to Fuze. It has much bigger screen to all Flare series, quad core processor, OTG cable support and 4000mAh battery power. Check out the Cherry Mobile Fuze full specs posteb by Cherry Angel. 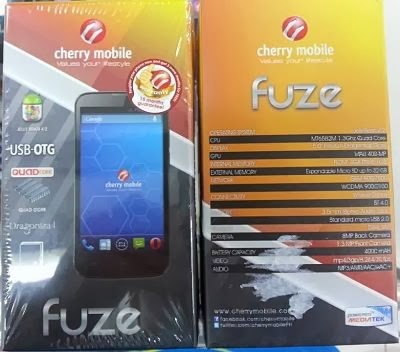 Fuze is just a little higher in terms of price than the Cherry Mobile Flare series but I think the battery power and screen is still a very good package for a quad core smartphone below 6000 pesos. You may check other Cherry Mobile Phone Price list to compare the cost of other Android phones. You can now avail Fuze at your nearesr CM kiosk, store and authorized reseller. You can also check your favorite online store for the availability of this phone. This is already available at @Cherry Angel or you can visit at Stall 10-28, 168 Shopping, Sta. Elena St. Binondo Manila.